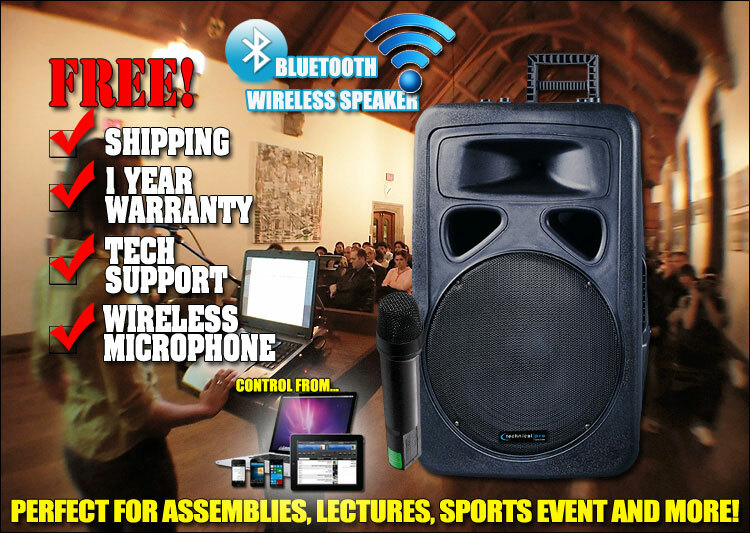 The WASP1100WBT 12" Battery Powered PA system with 2 Wireless VHF Microphone is a professional PA system that is easy to use and provides one of the best professional outputs out there. This unit can push out a total peak power of 1100 watts. 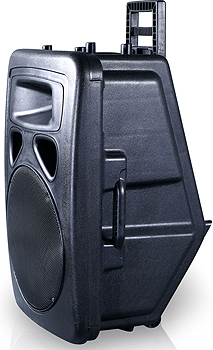 The speaker components consist of one 12'' woofer, a 2'' voice coil, a 60 oz. magnet and one Piezo tweeter. This is the combination of power and speakers you need to produce a huge and clear sound! 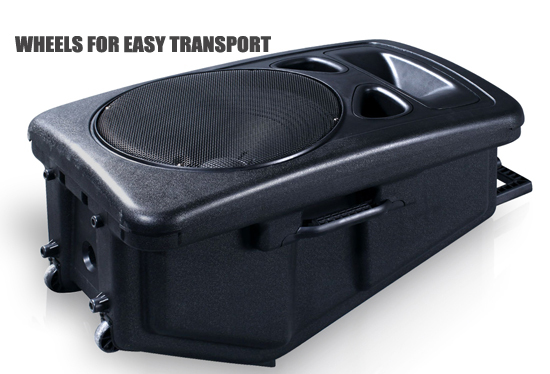 This is like having a full professional club sound system in an easy to use and easy to transport unit! There is a built-in rechargeable battery that fully charges in approximately 8 hours...complete with a battery voltage level indicator and LED-charging indicator. Included are Dual VHF wireless handheld microphones with a 50-foot range. This is an amazing asset to have while live! There is no need to worry about messy microphone cables and the large 50-foot range will allow you to walk around the stage or room and still properly address your entire audience! The inputs on this unit give you the modern options you need to stay current in today's advancing world of audio and sound. The inputs consist of an 1/8'' AUX, 1 RCA, Bluetooth® two 1/4'' microphone inputs with microphone volume, bass, treble & echo controls, two 1/4'' guitar input with separate volume control and a USB flash drive / SD Card input that accepts drives up to a maximum of 32GB and has the ability to playback .mp3 & .wma files. Play music from your iPod®, MP3 player or USB flash drive during your live event...this is perfect for before your event too...set the mood and play some background music! If you are a live performer, plug in your guitar and rock your crowd! Plug in standard sources such a CD/DVD player or turntable into the AUX and RCA inputs! The USB flash drive and SD Card can handle a maximum size of 32 GB & play your .mp3, .wav files from your USB flash drive or SD Card through the WASP1100WBT speaker. Forgot your USB flash drive at home? Want to play audio files from your phone while keeping it safe in your pocket? No problem. The WASP1100WBT's Bluetooth compatibility allows for wireless connection to any A2DP stereo Bluetooth device. That means you can play audio files from your phone, laptop or any other Bluetooth enabled device within a 30 foot foot range. The WASP1100WBT gives you the freedom to stream music wirelessly from any Bluetooth enabled device. The options and professional output are matched by the WASP1100WBT's sleek design. The unit is also built to last and very easy to transport. 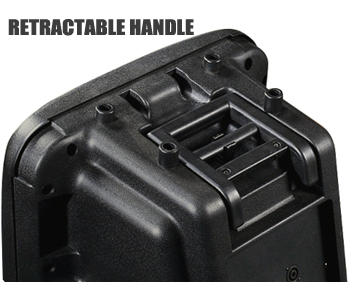 For added convenience there are two built-in microphone holster on the side of the unit. The heavy duty side carrying handle, wheels and a carry-on handle will make this very easy to transport and position while setting up. The full sleek and rugged construction of the WASP1100WBT will show your audience that you are professional using professional equipment. If you are addressing a large conference room, a club space or music type of venue, or rolling this baby out for a family party on the deck you will have all the options you need inside this sturdy compact unit! The WASP1100WBT is one of the user-friendliest devices available to a performer. It has gained the respect of professional sound people but you don't need to be a professional to use it...and it can be had for a price that is almost too low to list!